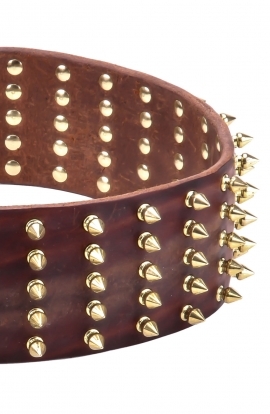 Search "gladiator collar" 82 results have been found. 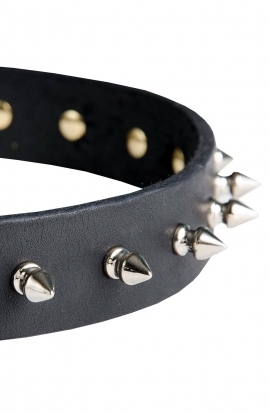 This genuine leather dog collar is crafted to be fashionable and functional. 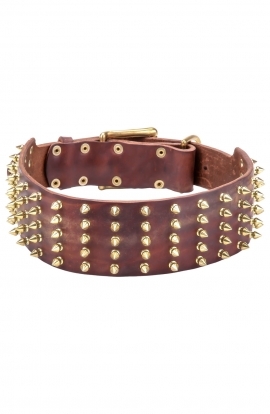 Extra wide (3 inch) and thick, it features brass hardware that is resistant towards corrosion and has magnificent look. 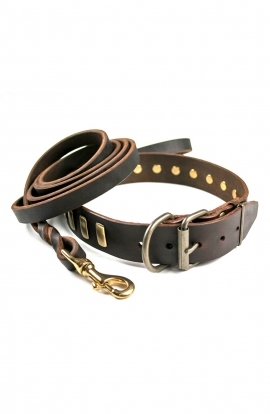 This luxury dog collar features one-ply genuine full-grain leather paired perfectly with rich, polished nickel-plated hardware. 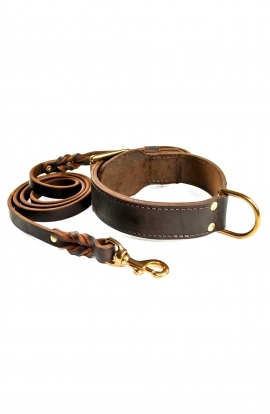 You'll love the look and feel of this luxury handcrafted leather dog collar. 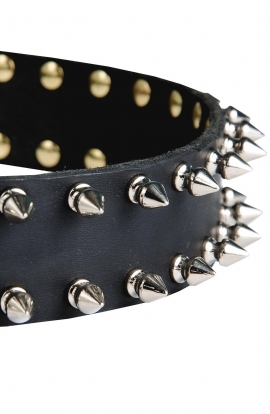 This 3 inch wide handcrafted spiked leather collar features 5 generous rows of spikes that are beveled and hand polished around the edges for extra comfort and dazzling look! 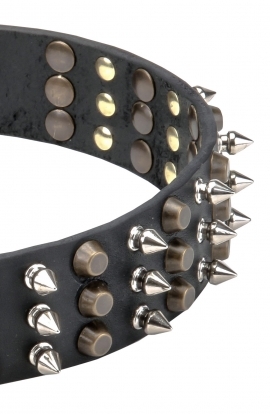 This fantastic spiked collar is strong when attached, but makes for an easy on and off function. 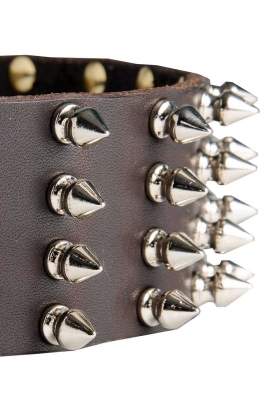 Adjustable metal buckle closure and two rows of nickel-plated spikes look really good on solid leather base. 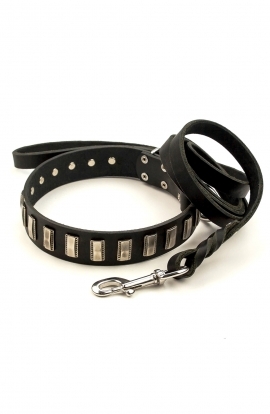 Graceful lines of polished metal and soft leather form a unique ensemble for one particular dog. 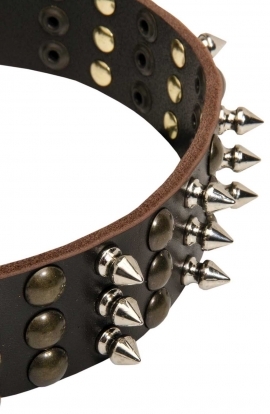 Here is one of the most fascinating leather collar on market. 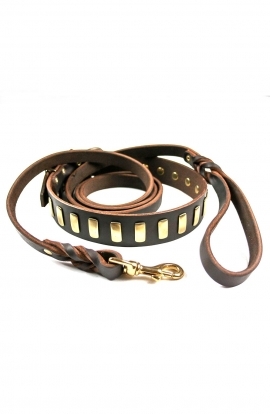 Full of style and elegance this leather dog collar has won the hearts of many dog lovers worldwide. 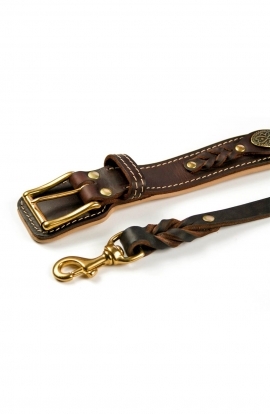 Excellent durability and comfort for your pet, individual style and functionality - that’s what all dog owners are looking for. And all these qualities are combined in this one product. 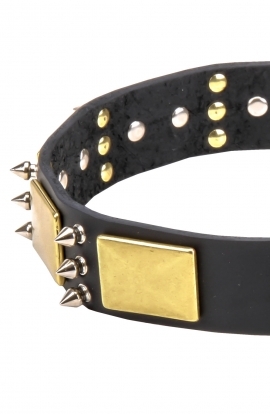 Here is a flashy collar that is tough and long lasting at the same time. 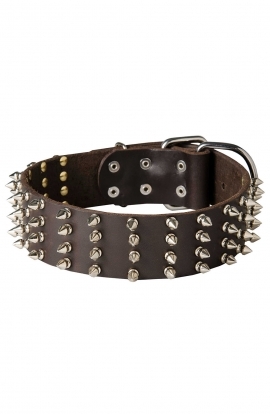 This beautiful 1 1/2 inch (40cm) wide spiked dog collar is made of quality pure leather. 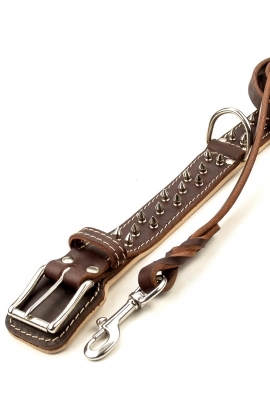 And it is a real work of art because is made by hand of the best craftsmen who produce equipment for dogs. 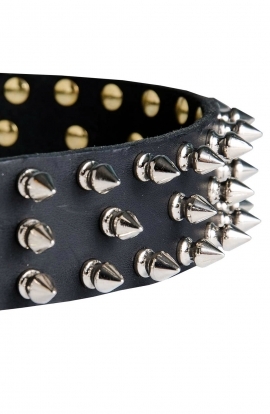 Decorated with an array of silver spikes this dog collar is a fusion of quality and style! 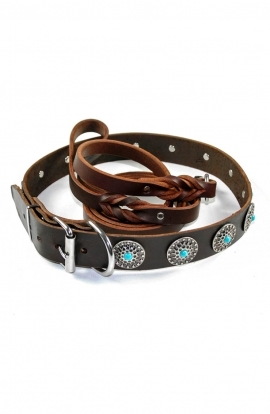 Awesome looking handcrafted dog collar is recommended here for your doggie. 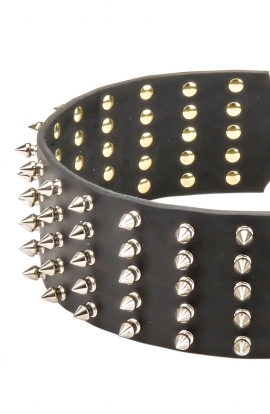 Excellent quality of materials and manufacturing will not leave you indifferent! 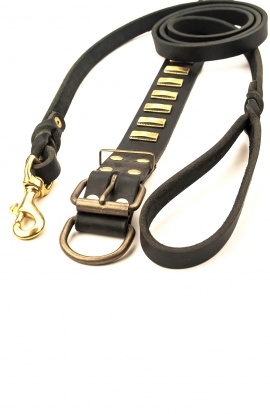 Genuine full-grain leather, that is thick, durable and pliable and rust-resistant high-quality metal fittings provide excellent reliability and unmatched stylish design. 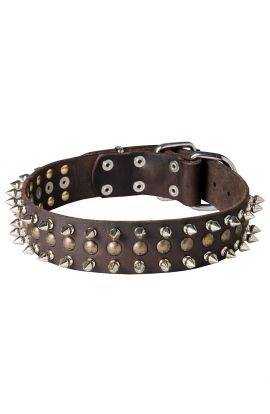 This beautiful 1 ½ inch wide spiked and studded collar is made of quality full-grain leather. 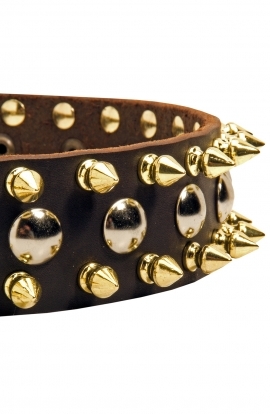 It features nickel-plated spikes and brass studs set in colomns. 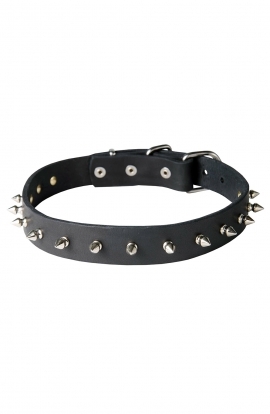 Strong and wide enough, it is recommended for large breed dogs. 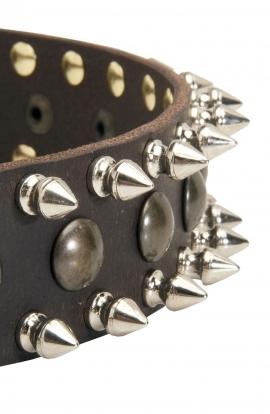 All the hardware is hand set and rust-resistant. Safe and convenient to use this item deserves your attention. 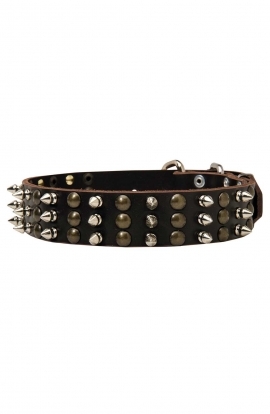 This stunning dog collar features 2 symmetrical rows of nickel-plated spikes with a row of brass circles between them for gorgeous style. 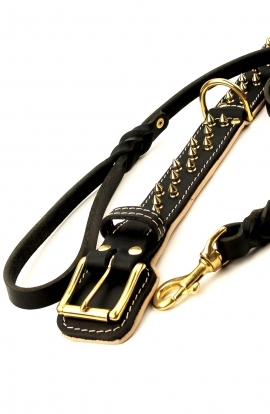 The sturdy construction of this item is suitable for large and medium size breeds. 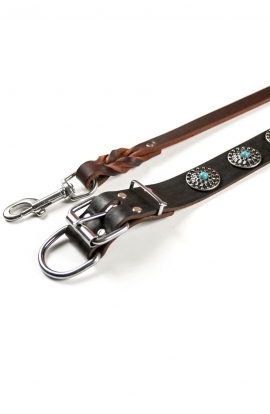 The thick leather is soft and flexible. 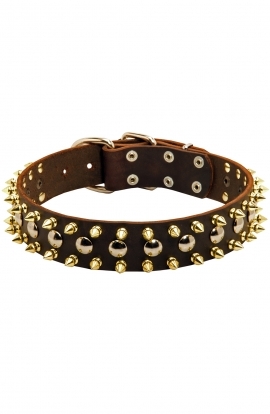 This gorgeous leather dog collar features four rows of nickel-plated spikes, that shine beautifully and give more luxurious style to your dog. 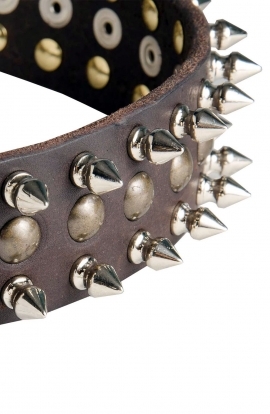 The spikes are set manually on the genuine leather strap using special brass rivets - very strong and gentle to dog’s skin. 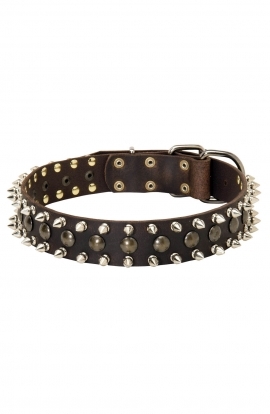 The “Top Paw Style” collar offers beautiful design combined smartly with maximal comfort. Copyright © 2017 OldMill Store. All rights reserved.